I’ve gone through the importance of abdominal breathing in Optimal Breathing: The Case for Diaphragmatic Breathing. In this post, I’ll talk about how to train for it, and then a basic method for training for using your diaphragm and abdomen breathing to generate intra-abdominal pressure (IAP), the optimal way for stabilizing your torso for movements. First, how do you know if you are already breathing with your abdomen or not? It’s easy. Right now, without thinking much, take a deep breath, then let it out. How did you take in your breath? Was it via your upper chest, or maybe your shoulders? Or did neither of those move and only your abdomen? If you didn’t move your chest or shoulders – congratulations you already breathe with your abdomen! Likely, this was not the case. You probably expanded your chest to take air in, or even lifted up on your shoulders to do it. The real test to know if you are breathing with your abdomen fully is to spontaneously perform this test without thinking and see what happens. A higher level test is to see what happens during a yawn or cough; those are really subconscious actions and if you take in air during either of those two events, you know you have burned in abdominal breathing. These exercises are designed primarily to teach you to turn off use of the chest and clavicular muscles to breathe, while encouraging use of your lower abdomen muscles instead. However, you should know that this is not the endgame. Abdominal breathing is merely the first step. This was my natural “stand up straight” stance at this time. Notice that my hips are pushed forward into what is called “sway back” or overextended lower back. I also have my chin tilted up, resulting in my neck/cervical spine also being overextended. But also notice the protruding belly as evidence that i was working on belly breathing. Often, people reject using their belly to breathe because they are afraid of looking like they have a beer belly – a cultural nod to vanity. So they contract their belly muscles to hold it all in. This causes people to use the wrong muscles to brace their torso – they contract muscles that are needed for breathing and realize that when they need to stabilize they have to hold their breath to do so, and then when they let air back out, their stabilization disappears! It wasn’t until I took Dynamic Neuromuscular Stabilization (DNS) that I could understand what was really going on in the torso during stabilization. Once you learn how to use the diaphragm correctly to create IAP, it turns out that your “beer belly” will disappear. 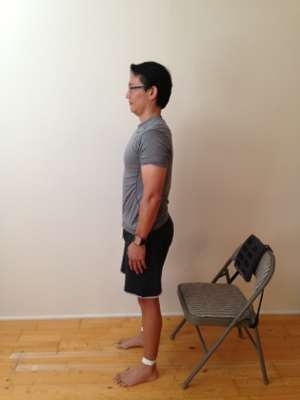 Note that good posture is defined as the lining up vertically of your earhole, the center of your shoulder, the center of your elbow, the center of your hips, the center of your knee, and last the ankle bone. I’m much better in the second picture, right? 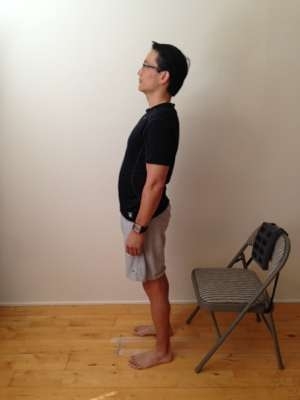 However, I was using Gokhale Method’s cues on activating the “inner corset” – it worked better than what I was doing, but they did not work on abdominal breathing nor IAP generation. Once I learned and imprinted this, I realized that it was an incorrect assumption that abdominal breathing leads always to a beer belly. When breathing this way, it caused activation of my transverse abdominis, this hidden sheet of muscle in the lower torso that is critical to stabilization of the entire body. I could thus remain stable AND breathe at the same time. Amazing! And…my beer belly disappeared because the transverse abdominals were activated all day long, holding my beer belly in check. When you learn these basics, you have thus laid the foundation for bringing proper breathing methodology and IAP generation to athletics. This entry was posted in Breathing, Nasal and Abdominal. Bookmark the permalink.